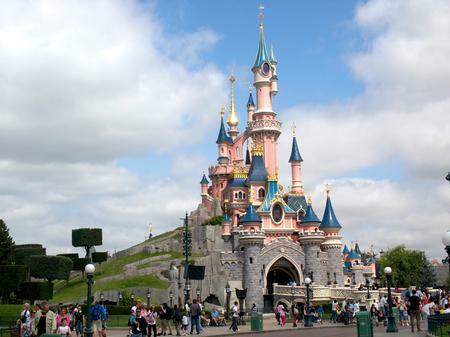 Disneyland Paris opened April 12, 1992 as EuroDisneyland and today draws more visitors each year than any other theme park in Europe. Visitors enter by walking underneath the Disneyland Hotel into the park's Main Street USA. "Le Chateau de la Belle au Bois Dormant" (Sleeping Beauty's Castle) awaits you at the end of the street, from which you can enter the park's Fantasyland, or peel off into Frontierland, Adventureland, or the Jules Verne-inspired Discoveryland. Fans of the Disney theme parks in the United States will want to take note that Paris offers a somewhat different version of Pirates of the Caribbean, a much more intense Space Mountain, and a twist on the Haunted Mansion, called Phantom Manor, which includes some scenes originally intended for the never-built Western River Expedition attraction at Walt Disney World.